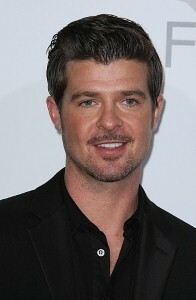 R&B singer Robin Thicke says being a dad is something he’s looked forward to for a while. "I was really excited when I found out I was going to be a father because I got the right lady," Thicke recently told VIBE magazine. "I’ve been wanting to be a dad for a while. Fatherhood feels wonderful. It feels like a family." The 33-year old crooner and his wife, actress Paula Patton, welcomed son Julian in April. Thicke says being a father has helped his creativity, too. "In all selfishness, my writing has never been better," he told EOnline’s Marc Malkin. "There’s so many new feelings and depths and thoughts and things that I care about and other things that I don’t." Thicke and his family spent Father’s Day at a barbeque with his dad, actor Alan Thicke, who’s been a great role model for his son. "I’m really loving, like my dad. He likes to hold babies and talk to them and hold them different ways and he showed me a couple of new ways of playing with and holding my son," Thicke told VIBE. His most recent single, "It’s in the Mornin’," features hip-hop artist Snoop Dogg. Thicke toured with Alicia Keys earlier this year.